Sometimes I feel that there are several important aspects of the history of Punjab, which have gone unrecorded. Although Punjabi pop music is currently dominating the musical scene of India, yet no one has taken pains to discover the pioneering times of its mother, the folk and light Punjabi music. I have hardly seen any material on the history of Punjabi cinema. This article is an attempt to record whatever I know about the history of Punjabi film music. History of Punjabi films is almost as old as that of Hindi cinema. The first talkie in Hindi Alam Ara was made in 1931 and the first Punjabi film was made in 1934, its print is unfortunately lost to our callous indifference towards our heritage. It is never too late to start preservation, I think it is time we should establish an archive of our old films and their music. Based on my research, I shall divide Punjabi music directors into three distinct generations. The first being the generation of pioneering music directors, who had no role models to follow? The second generation being that of the trendsetters and the third is the post 1980 period of pop music and innovations in folk. I shall not attempt to write about the contemporary music directors, who are currently composing the Punjabi music and making big bucks. I think it will be more appropriate to write about the strugglers of 1934 to 1979 period, who’s memories are already fading and very soon the people will start forgetting them. The first Punjabi music director was Ustad Jhande Khan. The second was Rafique Ghaznavi B.A. The third fourth and fifth music directors were Ghulam Haider, Pandit Amarnath and Pandit Gobind Ram. They all attained their peaks prior to 1950. Two more music directors Dalip Chander Vedi and Harish Chander Bali also fall into this category, but they did very little work. The second generation consists of among others Khurshid Anwar, Feroze Nizami, Rashid Atre, Master Inayat Hussain, Shyam Sunder, Pandit Husna Lal, Bhagat Ram, Hans Raj Behl, Vinod, Alla Rakha Qureishi, Shiv Dayal Batish, Madan Mohan, Sardul Kwatra, S. Mohinder, Roshan, Ravi, Khayyam, K. Panna Lal, Pandit Amarnath Second, O.P. Nayyar and Usha Khanna. Some of them did not compose music for Punjabi films, but by origin all of them were Punjabis. Out of all these, the ones I know intimately are S. Mohinder and Late Sardul Singh Kwatra. This article is about the life and works of Sardul Kwatra (1928 – 2005). Sardul Singh Kwatra was born and brought up in Punjab’s capital Lahore. Since childhood Sardul was fond of music. Lahore was a place where Punjab’s finest maestros attained name and fame. Sardul while studying in school got the initial training in classical music from Sardar Avtar Singh. Sardar Avtar Singh possessed good knowledge of most of the Ragas mentioned in Sri Guru Granth Sahib as well as those Ragas, upon which the folk tunes of Punjab are based. Among the male voices Sardul was a great admirer of Agha Faiz of Amritsar and among the females he was especially fond of the silken voice of Zeenat Begum. Sardul thought that Zeenat’s voice was culturally very well marinated into music. He was also a great admirer of Bade Ghulam Ali Khan and his brother Barqat Ali Khan. Since his childhood Sardul Kwatra had a fairly good knowledge of the basic tunes of Central Punjab’s folk songs like “Heer”, “Mirza”, “Tappe”, “Bolian”, “Jugni”, “Dhola”, “Mahiya”, “Multani Kafi” and “Saiful Malook”. Such knowledge came in handy when later on Sardul became a film music director. I had my first exposure to his film music, when I saw the first “Kwatra Production” a Punjabi film “Posti” in 1950 in New Delhi. Being a child I could not understand the story, but I certainly enjoyed the music and still remember its songs and tunes. In person, I saw him in 1957 in Amritsar, when he came there to accompany Mohammad Rafi in a mixed Hindi Punjabi film song concert. He was playing piano accordion and serving as the master of ceremony. The second opportunity came my way when I met Sardul Kwatra in the Madhya Marg shopping center in Sector 7, Chandigarh. It was a surprise meeting. I saw someone resembling Sardul Kwatra that I had seen in 1957. On asking he said that he indeed is Sardul Kwatra and has shifted from Bombay to Chandigarh. He said he is rediscovering his roots and wants to open a film institute in this city, where he will impart training in acting, direction, singing, dancing and tune making. I was thrilled to hear all that. From that chance meeting on we used to meet often in his “Chandigarh Film Institute” located in a sprawling Sector 5 house only a stone’s throw away from Sukhna Lake. There were chatting sessions in this building, the adjoining lake and at my house in Sector 11 that gave me a peep into his achievements and failures. I was fascinated by Sardul Kwatra’s brilliance as a music director of Punjabi films. His tunes reflected the real folk music of Punjab, the music of Lahore and Central Punjab of pre-partition era. His musical score for some Hindi films is also at par with that composed by some of the stalwarts of Hindi film music. Sardul disclosed that he has always been a highly romantic person and his best tunes were composed during various episodes of romancing. The first production of the Kwatra family was film “Posti”. The idea took shape while the family was still in Lahore, but the partition of Punjab left the family high and dry. After a short duration in Amritsar, the family moved to Bombay virtually penniless. Most of the cast of the film had also arrived in Bombay. Majnu, a Christian stage and film artist of Lahore performed the leading male’s role as Posti. Bhag Singh performed his father’s role. The heroine’s father was a very popular actor Ramesh Thakur. The lady for the role of the heroine was still being searched. Sardul Kwatra took it upon himself to choose a heroine. In Shyama, a seventeen year old budding actress Sardul found the heroine of the movie. Shyama, an athletically built charming girl hails from a Punjabi family. She was conversing in chaste Punjabi. Sardul’s choice received the final nod from the senior member of the family the elder brother of Sardul Singh and the producer of the film Harcharan Singh Kwatra. After initial hiccups financing was also arranged. The film was completed in 1949. It was an instant hit. The music was brilliant. Shamshad Begum and Mohammed Rafi were the leading female and male singers. A famous Hindi playback singer Rajkumari sang for the first time for a Punjabi film. Asha Bhonsle made her debut in film “Posti”. Sardul Kwatra said that he was a great admirer of the femininity and beauty of “Shyama” and Shyama was a natural dancer, who will instantly start dancing to the tune composed. Sardul never touched Shyama, but being a silent admirer, he created some of the most everlasting Punjabi tunes. The Kwatra family was so much impressed with Shyama’s fluent Lahori Punjabi and her natural gift of dancing and acting that it engaged her as the heroine for their second Punjabi film “Kaude Shah” made in 1952. Sardul Singh composed the music of this film too. Like “Posti”, “Kaude Shah” also became a hit movie. Its music reached newer heights in popularity. Shamshad Begum excelled as the female Punjabi film singer. Hindi cinema’s most romantic male singer Talat Mahmood also sang a Punjabi duet with Rajkumari for this movie. This soulful song “Zulfan Ne Khul Gaiyan, Akhian Ne Rul Gaiyan, Ki Khattia e Dil Laa Ke” is one of the evergreen Punjabi film songs. The Kwatra family shortly there after made a Hindi film “Mirza Sahiban” also in 1953. The hero was Shammi Kapoor, but the heroine once again was Shyama. This film did not do too much business, but it launched Sardul Kwatra as a music director for the mainstream Hindi cinema. Lata Mangeshkar and Mohammad Rafi sang most of its songs. The music became more popular than the movie. One Punjabi song in Rafi’s voice “Nahin Rees Punjab Di, Kehndi e Lehar Charab Di” became very popular all over Punjab. During the mid fifties, Shaminder Singh, a landlord from Muktsar in Ferozepore District reached Bombay with a hope to produce a Punjabi film and desire to have an opportunity to sing a song or two with Lata Mangeshkar. Shaminder with the collaboration of Kwatra Brothers produced a Punjabi film “Vanjara”. Lata was the leading female singer. Shaminder did sing a couple of duets with Lata. Sardul Kwatra scored the music. The film was not a big success, but Sardul Kwatra’s music attained new heights in excellence. Sardul Kwatra scored the music for a Hindi film “Pilpli Sahib”. Its songs are great pieces of art. Sardul did not hide his admiration for actress singer Suraiya. He always longed to compose tunes for her. Suraiya was a real star. She was rich and classy. She used to travel in a shoffer driven long black Cadillac Sedan. It was a treat to watch this VIP. In 1957, Suraiya accepted Sardul Kwatra’s request. The Kwatra family made a Hindi film “Goonj” in 1957. Sardul Kwatra himself composed the music. Suraiya became the lead singer and heroine. Sardul composed all the tunes by sitting in front of Suraiya. To Sardul, Suraiya was such a celebrity that out of reverence he will start sweating in front of her. Suraiya was fond of the finest perfumes, but French cosmetics were her first love. Sardul was aspiring to compose tunes that could match the scents radiating from Suraiya. This is how, according to Sardul’s own admission, he composed the memorable tunes of film “Goonj”. Some of the songs of “Goonj” are featured on the four cassette set of Suraiya’s songs as well as a two CD set released recently. Sardul used to admit that he did not have the courage to even formally shake hands with Suraiya. His romanticism revolved around secret admiration of Suraiya and that was enough to induce him into composing soulful tunes to be sung by Suraiya. On the day of the demise of Suraiya, Sardul was in uncontrollable tears. He was recollecting the precious moments he spent in her company in Bombay. Sardul and Mohammad Rafi used to be good friends. Rafi suspected that Sardul had cheated him of a sizable amount of money. Sardul denied it, but the industry had more faith in Rafi. That was one of the reasons of Sardul Kwatra leaving Bombay and initially settling in Punjab and later on moving to the United States. He had a wife and children, they were all nice folks. Somehow Sardul’s excessive romanticism became a bone of contention. He left his family behind in India and moved to the United States, in the company of a much younger girl, who aspired to be an actress and a dancer. There were two sons from this relationship, but some irreconcilable differences led to a divorce. While in the U.S. Sardul tried to stay in the profession of composing music, but California was no Bombay. In Bombay he could get the finest instrument players without much efforts, in California Indian style musicians were hard to find. Thus his film career came to an abrupt end. While in India Sardul Kwatra composed music for about two dozen movies, mostly Punjabi movies. “Billow” was another great musical, but it failed at the box office. 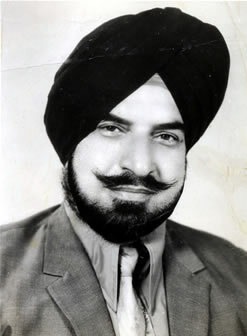 He composed music for the first Punjabi version of “Shaheed Udham Singh”; this film was also called “Sarfrosh”. This movie was not a bad failure. Sardul’s last movie was “Anthelia Métier” made in 1979. He had composed several tunes in America, but there were no takers. In America Sardul was a frustrated man. Several times, when he was in a pensive mood, he called me from California, we used to have long talks and from those conversations, I could extract a lot of material for this article. There are stories or rumours that Sardul wanted to romantically involve with some women in America too, but things here are not as easy as those could be in India. Plus age was not on his side. This led to, at times, heavy drinking on his part. He was diabetic and developed hypertension too. He died in 2005 as a financially uncomfortable and professionally frustrated man. I am firmly of the opinion that Sardul Kwatra was a genius, but his brilliance was at best under used. Staying in Bombay, during the years of his creative best, would have been best for music.